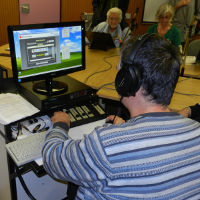 Sound News is produced by a team of volunteers who record all the major items from the local papers onto digital media then copy onto cassette tape. 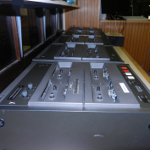 The one hour tape can take twice as long to record, with the setting up of all the equipment, the editing of the items which are to be read, and the retakes of occasional mistakes. But the actual recording is only a small part of the weekly exercise. With so many listeners, there is a lot of administration. Around 150 postal wallets have to be checked, and tapes examined and erased, new listeners added to the lists, address labels and records amended, and a set of wallets and blank tapes for the new mailing prepared. A service like Sound News requires time and money. The time is given by the four teams of around eight volunteers, who take it in turns to prepare the weekly tapes, and from whom, together with the listeners, the organising committee is drawn. Sound News is run entirely by volunteers. If you think you would like to help, please click "Contact us" for details.